. – Edward Cheserek pulled away from his last challenger with 1,500 meters to go and never looked back to become the first man in NCAA history to win three consecutive individual NCAA cross country titles Saturday at E.P. ‘Tom’ Sawyer State Park. 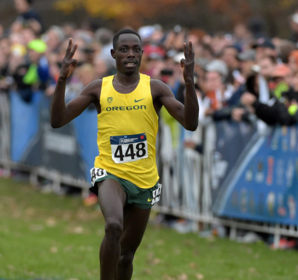 Cheserek’s historical effort highlighted a day that saw both Duck teams finish on the podium at the NCAA Cross Country Championships for the first time in seven years. The women, led by all-America performances by Waverly Neer, Alli Cash andMolly Grabill, had their best race of the season to finish third and win their first trophy in three years. Top-ranked New Mexico won the women’s race with 49 points, followed by Colorado at 129, Oregon at 214, Providence with 231 and North Carolina State at 264. The men fought their way to a fourth place finish. Syracuse scored 82 points to upset heavy favorite Colorado. The Buffaloes scored 91 points, followed by Stanford at 151, Oregon with 183 and Iona with 231. How It Happened – Men: The contenders for the men’s individual crown pushed the pace early as Cheserek, Patrick Tiernan of Villanova, Anthony Rotich of Texas-El Paso and Justyn Knight of Syracuse gapped the pack at the 2,000 meter mark. Tiernan then made his move at the midway point of the 10,000 meter race and Cheserek followed, leaving Rotich and Knight behind. The two ran shoulder-to-shoulder over the next 3,500 meters. Cheserek shifted into overdrive with 1,500 meters remaining and won his record-setting third NCAA cross country title going away in 28:45.8. Tiernan was second in 29:11.1. With the individual race over, the fight for a team trophy heated up, and the Ducks younger runners came through to push the Ducks on to the podium. Sophomore Travis Neuman from Bend, Ore., was 46th in 30:30.6, junior Jake Leingang placed 50th in 30:32.6, freshman Tanner Anderson was 56th in 30:39.3 and freshman Matthew Maton from Bend, Ore., was 85th in 31:50.0. That is a spread of less than :20 among the Ducks’ No. 2 and No. 5 scorers. Oregon also had senior Matthew Melancon from Eugene, Ore., 98th in 30:56.2 and senior Ryan Gil 121st in 31:08.7. How It Happened – Women: Oregon’s top five runners were able to stay near the lead pack through the first 2,000 meters, and then Neer and Cash maintained touch with the leaders over the final 4,000 meters. Grabill made a big push late in the race to bump the Ducks into the third spot, and Frida Berge, Ashley Maton, Annie Leblanc and Maggie Schmaedick ran in a strong pack to finish within :07 of each other and round out the scoring for the Ducks. Neer, a senior from Russiaville, Ind., finished 27th overall in 20:19.8, with Cash, a sophomore from Lexexa, Kan., 31st in 20:20.9. Grabill, a senior from Poway, Calif., charged past a couple dozen competitors over the last 500 meters to finish 33rd in 20:21.8. The Ducks also had Berge, a sophomore from Olve, Norway, 110th in 20:54.6, Maton, a junior from Bend., Ore., 112th in 20:56.5, Leblanc, a senior from Repentigny, Quebec, 116th in 20:57.2 and Schmaedick a junior from Eugene, Ore., 124th in 21:00.7. What It Means – Men: The fourth-place finish by the men represents their best NCAA showing since a runner-up finish in 2009. Cheserek joins distance running legends Gerry Lindgren of Washington State (1966, 1967, 1969) Steve Prefontaine of Oregon (1970, 1971, 1973) and Henry Rono of Washington State (1976, 1977, 1979) as the only three-time NCAA individual champions. It was the men’s 20th trophy finish in 40 all-time appearances. What It Means – Women: The third-place finish by the women’s team was the Ducks’ best since winning the national title in 2012, also in Louisville. It was the 11th trophy earned by the women in 26 all-time NCAA appearances. Neer earned her second career all-America award, while Cash and Grabill both earned their first cross country all-America certificates. Neer was honored previously for her 40th place finish while at Columbia. Notes and Numbers: Oregon last had both teams on the victory stand at the NCAA Championships in 2008 when the men won and the women were second ... The :41 spread for the women from their first to their seventh finisher was the school’s best performance at the NCAA Championships. ... Grabill and Leblanc became the 11th and 12th women to compete in four NCAA Championships for the Ducks. ... Four of the top 10 women’s teams were from the Pac-12. ... Three of the top four, and four of the top 10 teams in the men’s race were from the Pac-12. ... Neer, Cash, Grabill, Neuman and Leingang all posted career-best finishes at the NCAA Championships. ... Anderson had the third-highest finish among freshmen in the men’s field. ... Cheserek won his ninth overall individual title (cross country and track) and is now tied with Arkansas legends Mike Conley and Robert Howard for fourth all-time. Quotable: "Our freshman both went down early and then fought back. Our top seven beat everyone else's top seven so we had good depth. And what amazing accomplishment for Edward. To be mentioned with Pre and those other guys is really a credit to the work he puts in every day," - Oregon associate head coach Andy Powell. The Oregon cross country teams are in Louisville this weekend looking to make history new and old. The UO men and women will race Saturday morning in the NCAA Championships. Indomitable junior Edward Cheserek will be running for an unprecedented third straight men’s individual title — not to mention a coveted podium finish for the Ducks as a team. The UO women, meanwhile, are looking for a repeat from the 2012 meet also run in Louisville, when they took home their last national title. Cheserek, who this fall became the first Pac-12 runner to win three straight men’s conference titles, is looking to join the legendary Steve Prefontaine and two others as three-time NCAA individual champions. He would be the first to do it in three straight years. As is typical of the soft-spoken junior, he seems more concerned with getting the UO team into the top four, and onto the awards podium. Cheserek enters the meet after a victorious run at Regionals that also featured some encouraging performances by teammates. The same could be said for the women, who went into their NCAA West Regional looking to break 100 points, and survived sloppy conditions to finish with 79 points and a team title. Waverly Neer took second at the regional, leading five runners who finished within 45 seconds of each other. But unlike last year, when the Ducks took a pack mentality into nationals, UO women’s assistant coach Maurica Powellhinted at a more diverse strategy this weekend. Oregon’s other entries on the women’s side include seniors Molly Grabill,Annie Leblanc, Abbey Leonardi and Brianna Nerud; juniors Ashley Maton andMaggie Schmaedick; sophomores Frida Berge, Alli Cash and Emma Abrahamson; and freshmen Sarah Baxter and Jessica Hull. Cash, Berge, Grabill and Schmaedick scored along with Neer at regionals. The UO men also had a goal of 100 points at regionals, said associate head coach Andy Powell, and ended up with 99. Sophomore Travis Neuman enjoyed a breakout day, finishing fourth, and freshman Tanner Anderson also scored. Powell was confident enough in his team that another outstanding freshman,Matthew Maton, and transfer Ryan Gill were able to remain back in Eugene to prepare for nationals. Like the fifth-ranked women, the No. 9 UO men are projected to finish just off the podium. That they could challenge for the top four might not have been anticipated after the graduation from last year’s team of Eric Jenkins, Tanguy Pepiot and Daniel Winn. But Powell is confident in the way this year’s group is running entering the meet. The other men’s entries include seniors Chris Brewer and Matthew Melancon; junior Jake Leingang; and sophomores Jackson Darland, Bryan Fernandez, Blake Haney and Sam Prakel. “When you graduate three of the top five, that’s a little scary, and when you’re bringing in freshmen you never know how they’re going to develop,” Powell said. “But we’re happy to be in position to make nationals again. … We’d have to run well to get onto the podium, and that’s something for the guys that’s important to them.